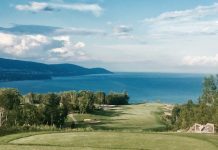 After the railroads laid track across North America in the early 1800s, hotels began popping up to cater to wealthy people who wanted to travel by train, like Hotel Roanoke in Virginia and Grand Hotel on Mackinac Island, Michigan. 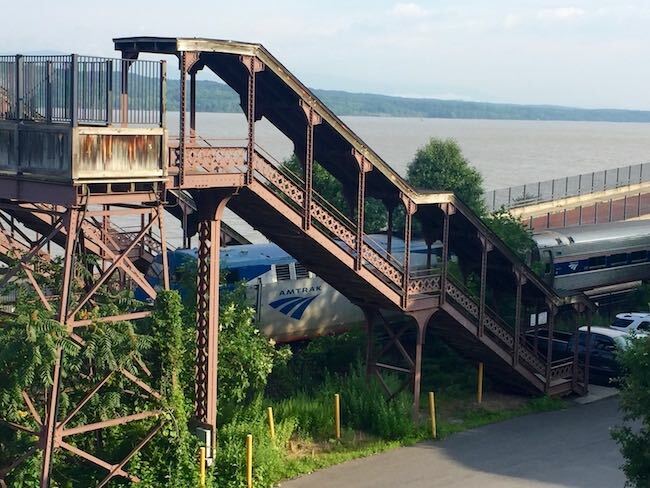 In the Hudson River Valley of New York State, architect George Vetch built The Rhinecliff in 1854 as a rooming house to serve travelers on the new Hudson River Railroad and the Rhinecliff-Kingston Ferry. Hugging the banks of the Hudson River, it’s a picturesque spot as well as a convenient one. New ownership by British brothers has breathed new life into the old girl and turned it into a charming boutique hotel. 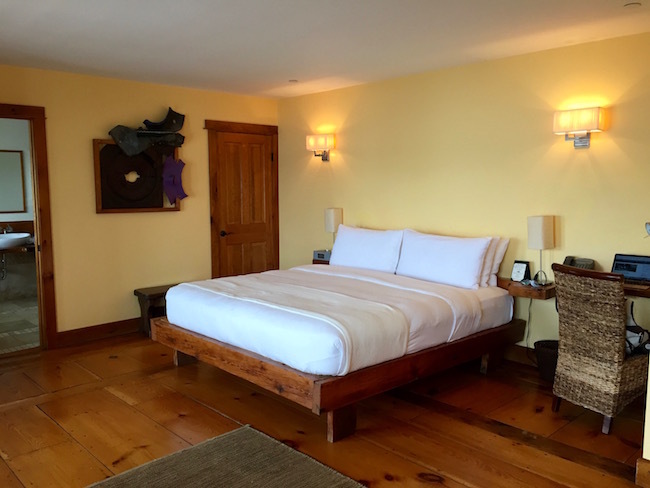 There are nine lovely spacious rooms with wide-plank hardwood floors and balconies overlooking the river. All but one room (a queen) have king beds. A desk and a couple of lounge chairs round out the furniture in our large comfortable room. There’s also a TV, music alarm system, an iron/iron board and clothes steamer. WiFi is complimentary. The bathroom is an artful delight! 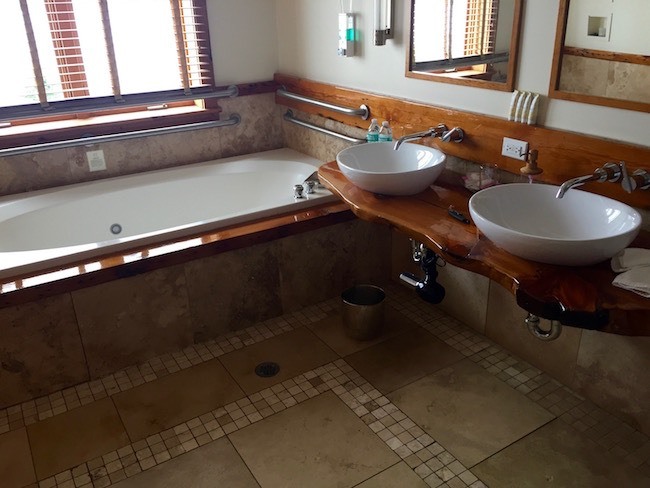 Two sinks (something I rarely see in even high-priced hotels that makes sense for a room with two people) rest on a carved wood counter. Beautiful inlaid tile surrounds the whirlpool soaking tub and separate shower. Above the tub are three small shelves holding battery-operated candles to set the mood for a romantic soak. The owners, I’m thinking, must be sentimentalists with fanciful touches like these throughout the inn. 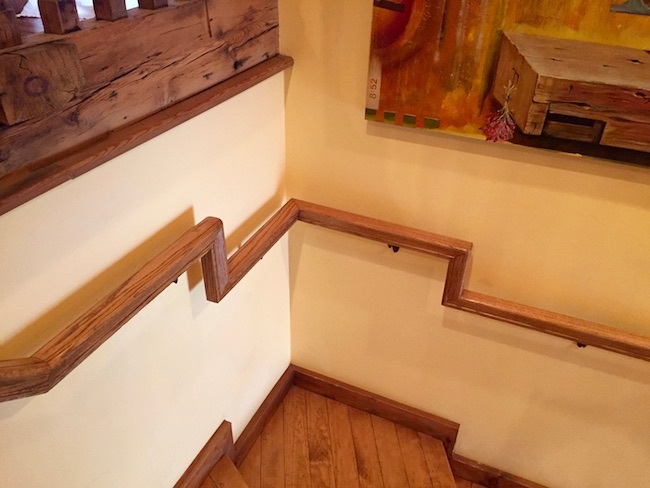 They restored many of the original wood floors, beams and doors to retain the character and sense of place. The bed was so comfortable, neither of us heard the train! We did see and hear it later the next day. And, yes, it is part of the charm! And part of the convenience: trains stop at the Amtrak station below the hotel about every hour coming in from New York City’s Penn Station and running up to Albany. 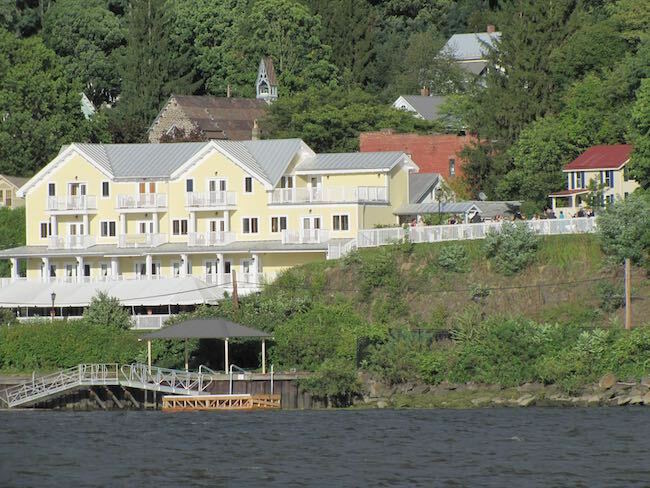 It’s just a 90-minute trip from the city to the front door of the The Rhinecliff. 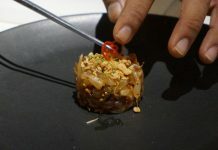 The Bar is a casual lounge with a shared-plates menu. 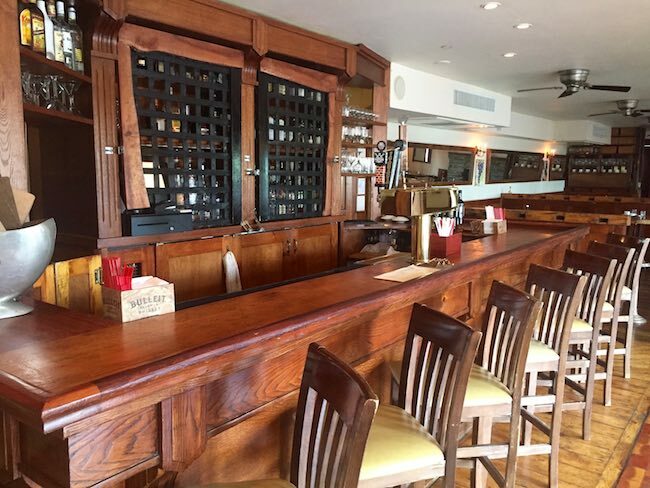 The bar in The Bar is the original from more than 150 years ago. We didn’t have dinner here, but we enjoyed a delightful full breakfast on the patio watching boats go by on the river. The inn hosts a Jazz Brunch on Sundays with classic brunch dishes served up with a top-tapping beat. Another first-floor banquet room is available for special events, as is the extensive patio and lawn. Rhinebeck is a charming little town near the Hudson River, a two-minutes drive from the hotel in upper Dutchess County. It’s amazingly cosmopolitan for its size: plenty of very good restaurants, unique boutiques, visual and performing arts and an indie movie theater. History comes alive at The Great Estates, homes of prominent people in America’s past. In Hyde Park, the 32nd U.S. President Franklin D Roosevelt’s home and library (the country’s first presidential library) delve deep into his presidency and personal life during a tumultuous time in the 20th century with self-guided tours, interactive displays and films. 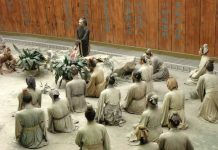 As the only president to be elected four times, his term lasted from 1933 until his death in 1945. First Lady Eleanor Roosevelt’s private cottage is filled with mementos and photos from her illustrious life, much of it apart from Franklin. It’s the only historic site for an American First Lady. 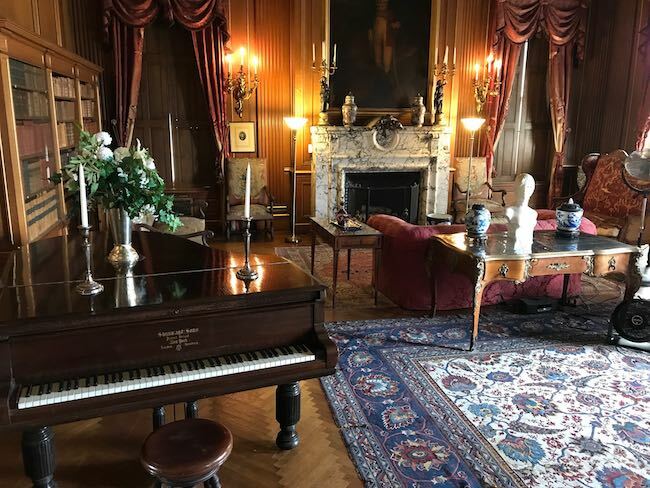 The fabulous country palace of The Vanderbilts offers a glimpse into how America’s richest family lived during the Gilded Age (1876-1917) when America became an industrial, financial and political world power. In Staatsburgh, the Mills estate is an example of that era and shows how wealthy Americans imitated the opulent lifestyle of European aristocracy. Other historic homes from other eras are in Germantown, Poughkeepsie, Beacon and Rhinebeck, all within a short distance of each other along the Hudson River. Access all with The Great Estates Pass. Also in Hyde Park is the Culinary Institute of America, one of the reasons there are so many great restaurants in the area. We took a tour of the campus, then stayed for an excellent dinner at their French restaurant Bocuse, one of nine eateries operated and staffed by the school. 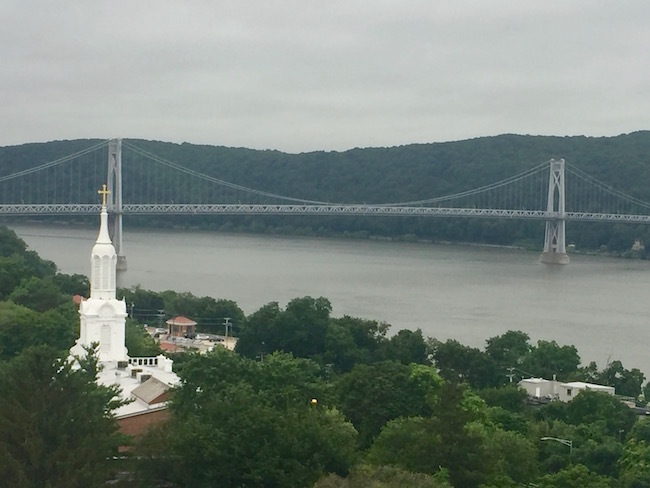 You’ll definitely want to stroll on the Walkway Over the Hudson, the world’s longest elevated pedestrian bridge in Poughkeepsie. Initially built as a railroad bridge, it was transformed into a pedestrian park in 2009. We walked nearly to the middle until threatening skies forced us to turn back. 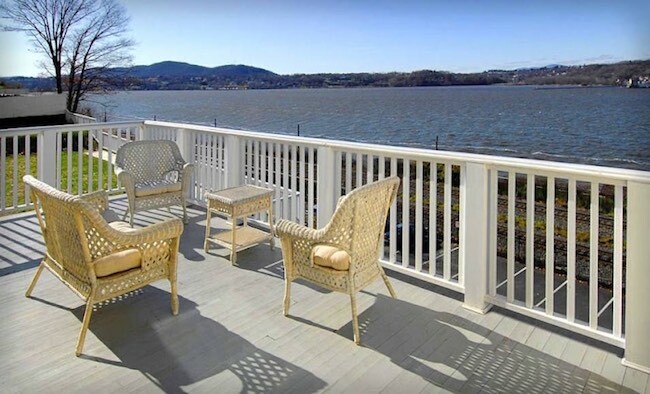 The views of the Hudson River and surrounding neighborhoods are truly incredible. Besides the CIA, we loved the Artist’s Palate in Poughkeepsie for dinner (a thoughtfully creative menu with seasonal dishes in a contemporary setting with rotating artists’ works) and Hyde Park Brewing Company for lunch in Hyde Park (way beyond normal pub fare; many dishes incorporate their beer).